Many people suffer from bothersome symptoms like hives, itchy skin, low blood pressure, heart palpitations and more without knowing that they are caused by histamine intolerance. 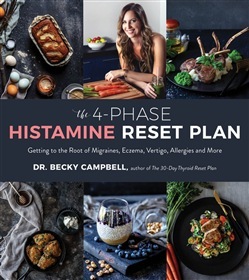 Board-certified Doctor of Natural Medicine and author of The 30-Day Thyroid Reset Plan Becky Campbell teaches you everything you need to know to identify high-histamine foods you are sensitive to and eliminate these symptoms and improve your health and well-being. The 30-Day Histamine Reset Plan fills you in on everything you didn’t know about histamine intolerance and its causes and symptoms. Dr. Campbell also outlines a four-step plan that will help you identify the foods you’re sensitive to and cure ailments such as vertigo, allergies, migraines and more. The four-phase diet plan is full of flavorful, low-histamine paleo foods; the first three phases instruct you which foods to eliminate from your diet to reset your health and support your organ functions, and the last phase help you slowly reintroduce foods. The plan is supported by tasty recipes for every meal that have adaptations based on which phase you are in. Acquista The 4-Phase Histamine Reset Plan in Epub: dopo aver letto l’ebook The 4-Phase Histamine Reset Plan di Dr. Becky Campbell ti invitiamo a lasciarci una Recensione qui sotto: sarà utile agli utenti che non abbiano ancora letto questo libro e che vogliano avere delle opinioni altrui. L’opinione su di un libro è molto soggettiva e per questo leggere eventuali recensioni negative non ci dovrà frenare dall’acquisto, anzi dovrà spingerci ad acquistare il libro in fretta per poter dire la nostra ed eventualmente smentire quanto commentato da altri, contribuendo ad arricchire più possibile i commenti e dare sempre più spunti di confronto al pubblico online.